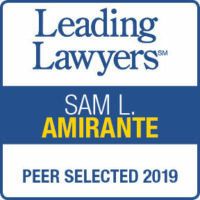 Sam L. Amirante & Associates, PC is where your legal and investigative needs are met. We ensure that our client’s constitutional rights are upheld. Our team of litigators are experienced in the areas of Criminal, Traffic/DUI, Family, Divorce, and Personal Injury law and litigation. Our philosophy is that every client has the right to due process and equal protection under the law. No matter what the offense or legal problem is – we will protect your rights Whether you are experiencing domestic issues, have been injured or have been charged with a crime we will fight for you. Sam L. Amirante & Associates practices in all counties in the State of Illinois. We have tried cases in Indiana, Iowa, Wisconsin, Nebraska, Washington state, Florida and California.Whether your case is at the local or federal level; we will be there and fight for you. If you need representation in your state call us today, we’d be happy to discuss your case with you.